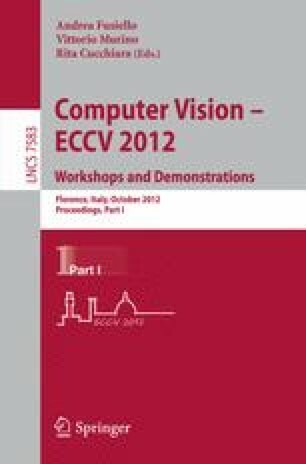 An action recognition algorithm which works with binocular videos is presented. The proposed method uses standard bag-of-words approach, where each action clip is represented as a histogram of visual words. However, instead of using classical monocular HoG/HoF features, we construct features from the scene-flow computed by a matching algorithm on the sequence of stereo images. The resulting algorithm has a comparable or slightly better recognition accuracy than standard monocular solution in controlled setup with a single actor present in the scene. However, we show its significantly improved performance in case of strong background clutter due to other people freely moving behind the actor.